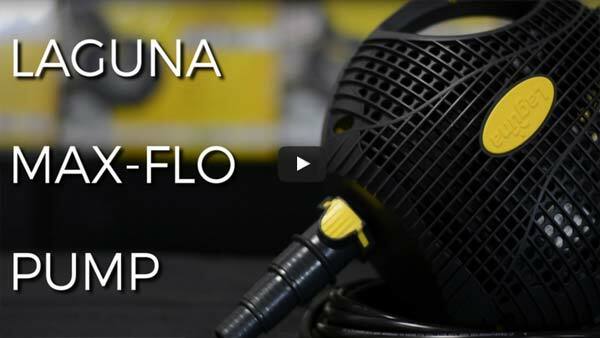 Review: Laguna Max Flo Waterfall and Filter Pump This Max-Flo is ideal for use with filtration systems and for creating waterfalls and streams. Easy to install and operate, the pump is completely submersible and engineered to run continuously. This Max-Flo is ideal for use with filtration systems and for creating waterfalls and streams. Easy to install and operate, the pump is completely submersible and engineered to run continuously. It is powered by a magnetic-driven motor and is designed to circulate water loaded with moderate amounts of solid particles (or solids) and transport them to suitable external filter systems (including pressurized filters). The pumps magnetic-driven motor, energy efficiency, and user friendliness are at this pumps best features.